It is easy to understand horse color genetics at a basic level, since the basic coat colors of black, bay, brown and chestnut (including sorrel) are controlled by relatively few genes and not radically affected by the environment. On this horse color genetics page you will find a discussion of these genes and their affects on the phenotype (external appearance) of various colors and shades of horse. 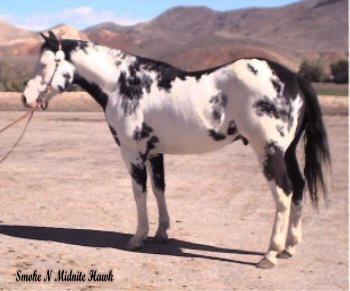 Other coat colors, such as palomino and dun, and coat patterns, such as overo and appaloosa, may be a little more complicated, but not beyond the grasp of the dedicated horse color genetics enthusiast. Most coat colors of the horse are easily recognised by most horse owners. However a quick look through chat sites on the web indicates that some horse owners are confused about horse color genetics, or would just like more information on the subject. Some understanding of horse color genetics can be important to breeders, regardless of whether they specifically breed their horses with color or pattern in mind. For example, it’s not possible to breed pure-bred palominos or overo horses, although the reasons for this are different in the two cases. 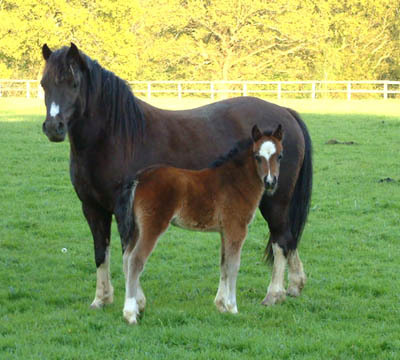 When breeding overos together not only is there the chance of producing non-overo horses, there’s also a chance of producing a foal that dies soon after birth. On the other hand breeding tobiano paint horses together does not carry this risk. 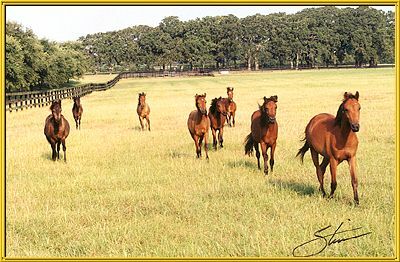 Obviously the responsible breeder wants to avoid making potentially damaging matings, even if the color of their foals is otherwise of little concern to them. To do this a basic understanding of horse color genetics can be useful. There are some who get rather stuffy about those who like to breed horses and ponies of a particular favourite coat color or pattern. In my experience though many serious breeders of this sort like to breed for conformation and temperament in addition to color, markings and/or pattern. While it may be a truism that a good horse is never the wrong color, all else being equal, you might as well have a good horse that you (and others like you) like to look at! The area of horse color genetics is not a static one. Although much is now known about the inheritance of coat colors some geneticists are actively researching the molecular mechanisms of color production and distribution. In recent years geneticists have characterised some horse coat color genes at the molecular level, and horse color genetics tests are now commercially available to horse breeders. Horse color genetics has also seen a renewed interest in the inheritance of some of the rare and lesser known colors and patterns, such as champagne, taffy and brindle. Thus opportunities still exist for both professional researchers and enthusiastic amateurs to further our understanding of the fascinating area of horse color genetics. All horse colors are, or result from some modification of, black, bay and chestnut. 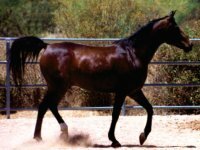 All horse colors are either the base colors, which are black, bay and chestnut (including sorrel) or result from some modification of these colors. It is possible that brown is also a base colour, although there may be more than one explanation for brown coloured horses. Three major genes are known that determine the base horse colors. These are designated A, B and E. Understanding about these three genes is a good basis for understanding about horse color genetics. Other genes exist that control the modification or absence of color and/or patterning, and are discussed later. This link is to a diagram summarising the effect of the three major genes on base colors. You might like to refer to it from time to time during the discussion of the horse color genetics. To understand horse color genetics you need to realise that horse colors are under separate genetic control from patterns and markings. Therefore when first learning about horse color genetics it is generally helpful to initially ignore white markings. If you are specifically interested in spotting (appaloosas), paints (“colored horses”) or other patterns these have a genetics of their own, which discussed in other sections of this web-site. See at the bottom of the page for links to these, and more pages on horse color genetics. The underlying color, whether a paint is black (as in piebalds) or chestnut (as in skewbalds) for example, is determined by the genes controlling horse color. 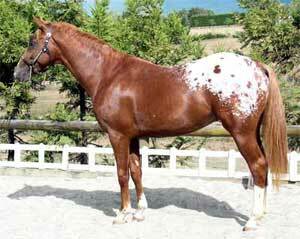 Similarly red roans are chestnuts with a roaning pattern, with the coat color and roaning determined by separate genes. White markings and patterns are due to an absence of color. White leg and face markings are under complex genetic control making it relatively difficult to breed for even markings (i.e. several genes affect these characters). Gray is interesting in that the action of graying genes causes a more or less gradual change in the underlying coat color. 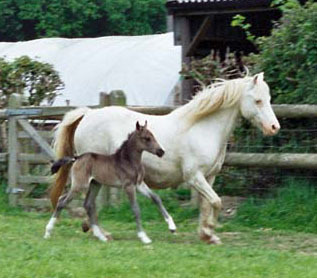 It is a process that occurs with ageing so that a gray foal is born some other color and eventually looks almost white (though they are not genetically white horses). In horses the B locus probably only has a single allele, designated B+. The B stands for brown (not black). The plus sign indicates that the allele is thought to be the wild type or ancestral allele. If there is only one allele at the B locus then all horses must carry two copies it, one inherited from their mother, the other from their father. They are therefore said to be homozygous for this allele, i.e. of genotype B+B+. This simplifies horse color genetics: since all horses are the same for the B gene it can usually be ignored when considering the genotypes and phenotypes of horse colors. In some animals, such as mice, cats, dogs and goats, there are other alleles at the B locus. Donkeys may be a dark chocolate brown color, possibly due to the recessive allele Bb, which produces chocolate in other species. Some geneticists think that Bb may exist in horses, since chocolate colored horses with a light brown skin and amber eyes do occasionally occur. It is likely though that these are in fact champagne blacks (classic champagne) and browns (sable champagne), colors not requiring the existence of other alleles at the B locus. 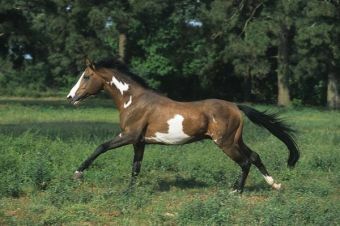 Another horse color called chocolate taffy also exists, but isn’t due to alleles at the B locus. This particular geneticist thinks that the evidence for another allele at the B locus is not strong! Coat pigmentation is determined by the presence, absence or relative proportions of the pigments eumelanin and phaeomelanin. Eumelanin is either brown or black in color, phaeomelanin is either a reddish or yellowish brown. 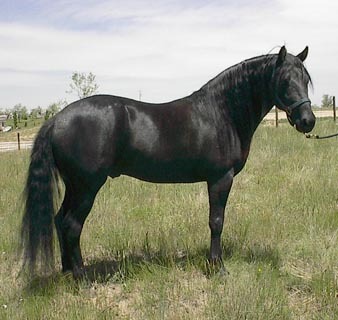 In horses of genotype B+B+ the eumelanin – if it is produced at all - is always black. Some alleles at the E locus can cause a switch from eumelanin production to phaeomelanin production (i.e. from black to red). These alleles override (and therefore mask) the effect of the B locus. This kind of gene interaction where one gene masks the phenotypic expression of a second gene is called epistasis. Epistasis is a gene interaction that crops up quite a bit in horse color genetics. The phenotype is governed by the masking gene when both are present together in the genotype. A gene that masks another gene’s expression is said to be epistatic, while the gene whose expression is masked is said to be hypostatic. The interaction between the B and E loci is discussed further later on, after the E locus has been considered in more detail. Horse color genetics is concerned with two basic coat color pigments: phaeomelanin (red)and eumelanin(black). Modifications of these pigments produce the whole spectrum of horse colors that we observe in modern horses. Red pigment is produced by the recessive alleles of the extension locus (designated E). Alleles of the E or extension locus (E+, e and ea) determine whether eumelanin or phaeomelanin is synthesized. E+ is the dominant allele and horses of genotype E+E+, E+e or E+ea produce black eumelanin pigment, resulting in the horse colors of black, brown or bay and their derivatives, depending on the genotype at the agouti (A) locus. The alleles e and ea differ slightly in their molecular composition but nevertheless have the same effect on horse colors, causing a switch from eumelanin production to phaeomelanin production. Animals homozygous for either recessive allele, or of genotype eea are therefore chestnut, sorrel or a color derived from chestnut (such as palomino or red roan), with black pigment being found only in the skin, and not in the coat. One fact of horse color genetics is that since “red” horses are true-breeding it is easy to breed red foals. 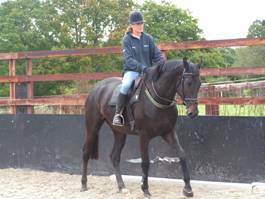 It is, however, more difficult to breed black horses, since they may be of genotype E+E+ or they may be heterozygous (i.e. of genotype E+e or E+ea). Breeding together heterozygous blacks may produce chestnut foals. A horse color genetics molecular test called the red factor test is available to distinguish allele E+ from the recessive alleles, which is useful information for people wanting to breed blacks horses. The test is for black horses whose genotype at the extension locus is ambiguous, for example because they have never been used for breeding or because they have only produced one or a few (black) foals. The A or Agouti locus controls the distribution of black pigment in horses with at least one E+ allele at the extension locus: whether it occurs evenly throughout the body, as in true black horses, or only in certain parts, as in bays and browns. According to Gower (1999) it may also have some affect on the shade of horses of genotype ee at the extension locus, although this can also be affected by nutritional, seasonal and other environmental factors, as well as by other genes, such as sooty (Sty) and flaxen (F). You might want to refer to the horse color genetics diagram during this section. The agouti gene controls a switch from normal eumelanin production to a reddish (or sometimes yellowish) form of phaeomelanin in the body of the horse, but not in the mane, tail and points (lower legs and ear rims). We will consider now the effect of the agouti alleles on horses with at least one E+ allele at the extension locus and no other modifications (such as those causing buckskin, dun or grey). We will return later to the possible effect of the agouti alleles on horses of genotype ee (and presumably genotypes eea and eaea too). At the moment there is only molecular evidence for two agouti alleles. The recessive one which causes black when homozygous, and the dominant one which causes bay. The recessive allele Aa has no effect on eumelanin production. Horses of genotype AaAa therefore have a base color of black. Breeders interested in producing black foals would ideally have black horses of genotype AaAa E+E+, i.e. true-breeding blacks. The red factor molecular genetics test can be used to check out whether black horses are homozygous at the extension locus. Gower suggests a plausible scheme involving a 4 allele series at the agouti locus, which would explain brown and various other observations. Until recently (2009) only two alleles of the agouti locus had been identified at the molecular level. It seemed possible, however, that there may be more than this. One possibility is particularly well discussed and developed in Jeanette Gower’s book (1999). It is based on her observations as a breeder and long-time enthusiast. Although one can think of other possible explanations for some observations, Jeanette’s hypothesis is worthy of consideration. Some aspects of colour are uncertain. For example, brown horses. They’re not exactly black, they’re not bay. Seal browns might be black horses with a gene called “mealy”, which gives pale red or yellowish areas on the lower belly, flanks, behind the elbows, inside the legs, muzzle and over the eyes. It is caused by a dominant gene symbolized as Pa+ (it‘s other name is pangarré). Some think the same gene causes sorrel chestnut (the lightest shade of chestnut, Thiruvenkadan et al, 2008). However, McCann (1916) reported that sorrel is recessive to chestnut and mating among sorrel horses gives sorrel offspring only. That is certainly inconsistent with sorrel being caused by a dominant gene. And what about horses that are more or less uniformly brown? Are these all due to the presence of other dilution alleles, such as champagne, on an otherwise black coat? I’ve seen a beautiful chocolaty brown coloured warm blood that tested black, with non of the dilution genes for which there’s currently a test. This could be black with an unknown dilution gene, or it could be that it has a variant agouti allele not identified by the current agouti test. Then there’s the case of chestnuts with black, or very dark brown and black tails and/or manes. My mare Smart Little Emily is one such, with both her mane and tail very dark. She is otherwise chestnut, with slightly paler lower legs and a beautiful red sheen. 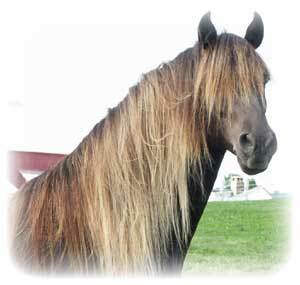 Many of her relatives are similarly coloured, or have just a dark tail, with a chestnut mane. They are not otherwise “sooty” in the way this is usually described in genetics literature. Clearly there are still things we don’t know about horse colour! Back to Jeanette, who supposes that there may be four alleles at the agouti locus. Her model is discussed below. You need to understand that it is not yet (to my knowledge) proved or even universally accepted, but it is a reasonable hypothesis, and science proceeds by testing hypotheses. Who knows, maybe one of you may one day get the opportunity to test it! The allele described as At has now been indentified and a molecular test for it is now available. Gower suggests the presence of an allele At, which is dominant over Aa, but recessive to other alleles of the agouti series. She suggests that horses of genotypes AtAt or AtAa are brown. Their soft parts, such as the muzzle and eyebrows, and around the flanks, quarters and girth, are changed to red or yellow (“mealy”). Their bodies may remain black (as in seal browns) or be shaded black and brown. Brown horses can therefore look all shades from light brown to almost black. This allele has now (2009) been found and sequenced. A genetic test now exists for it. Allele AA is dominant over both At and Aa, but recessive to the wild-type allele A+. A+ is therefore dominant to all other alleles in the series. 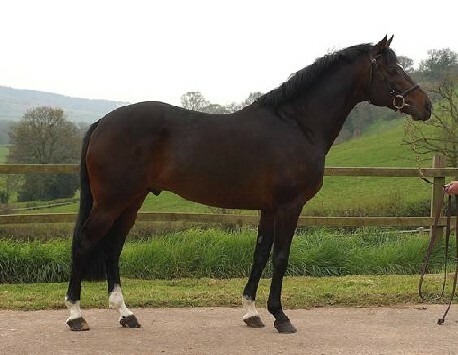 Horses with allele AA but not A+ are bay, with a black mane, tail and points. Their bodies may be reddish-brown (as in standard, blood and mahogany bays), orange-red (as in copper bays) or yellowish (as in golden bays) and may have a black cast. Horses with allele A+ are light bay. Their points, along with the mane, may be less strongly marked than for other bays (they may be “off-black”). The black on the points may also be more limited than for other bays (e.g. restricted to the fetlocks of the legs). There is some evidence that the shade of chestnut horses may be affected by the genotype at the agouti locus (as discussed in Gower, 1999). It would seem that different alleles of the agouti locus are responsible for different forms of phaeomelanin (red pigment) in chestnut horses, as well as in horses of the other colors. Evidence suggests that chestnut horses of genotype AaAa are liver chestnut, while chestnut horses with an A+ allele are light chestnut. A summary of the effects of the different agouti alleles on chestnut horses is shown below, along with the hypothesised affects on palominos. The genotypes are shown using an underscore, e.g. AA_. This represents where an allele can either be the same as the allele shown (i.e. giving genotype AAAA in the example) or any other allele recessive to it (i.e. either allele At or Aa in the example, but not allele A+ which is dominant over all other alleles). Allele Aa is recessive to all the other alleles of the agouti series. You might also want to refer to the horse color genetics diagram at this point. 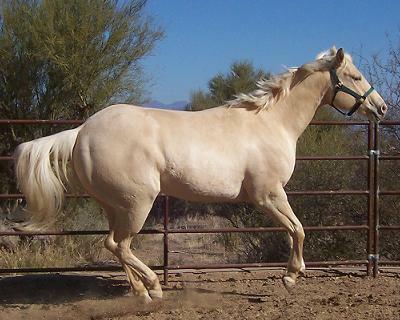 This scheme looks plausible and suggests how horse color genetics can be used by palomino breeders to increase their chances of producing the “ideal” golden palomino. Gower also suggests that AAAA horses may be redder than AAAa horses and a better choice for producing golden palominos. The agouti locus reduces eumelanin production in certain parts of bay and brown horses, probably due to the gene only being operative (“switched-on”) in these parts. Different alleles of the agouti locus are responsible for different forms of phaeomelanin, including in chestnuts and palominos. Color dilution results in a lightening or silvering of the coat and sometimes of the skin too. Horse color genetics examples of dilution include palomino, buckskin, cremello, dun, champagne, silver dapple and grullo. Alleles controlling color dilution are dominant or semi-dominant. Some of the dilution genes, e.g. cream, may significantly affect certain pigments but have only a minimal affect on others (cream dilutes the “red” phaeomelanin pigments to yellow or cream but may have little effect on black eumelanin pigments). This can cause the gene to apparently appear from nowhere, or sometimes to disappear. In the case of cream a seemingly black or bay horse could produce a palomino or buckskin foal, showing that it was in fact smoky black or smoky cream. This diagram summarises the effects of the cream, champagne and dun dilution genes on the base coat colors. Alleles at the C locus (the cream dilution gene) are responsible for the palomino, buckskin, smoky black, cremello, perlino and smoky cream. The two known alleles are designated C+ and CCr. CCr is semi-dominant and dilutes red to yellow in a single dose and to pale cream in a double dose. 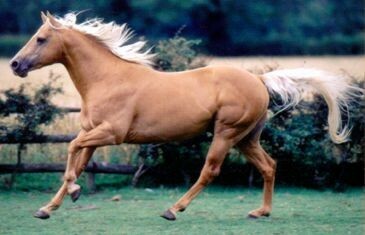 Thus horses of genotype C+CCr are either palomino (for a horses with a chestnut base color) or buckskin (for a horses with a brown or bay base color). Horses homozygous for the CCr allele are either cremello (for a horses with a chestnut base color) or perlinos (for a horses with a brown or bay base color). Cream dilution can have a very subtle effect on black pigment and horses with a black base color are diluted to smoky black (C+CCr) or smoky cream (CCrCCr). It can be very difficult to tell if a seemingly black horse carries the CCr dilution allele, and some horses with the CCr allele have been classified as dark bay (Mariat et al, 2003) or liver chestnut. The wild-type C+ allele is effectively recessive since it needs to be homozygous for there to be no dilution of the base color. Horses of genotype CCrCCr have pink skin and blue or glass eyes, and are sometimes called pseudo-albinos. In other animals (including humans) there are recessive alleles at the C locus that cause true albinism. Individuals homozygous for these alleles lack pigment in the hair, skin and eyes. Their eyes and skin are pink (due to the effect of the blood vessels beneath the surface) and albinism is often accompanied by various congenital defects. No true albino horses have ever been observed and presumably they are inviabl>e (i.e. die in utero). The dilute champagne colors have been about for some time, but from the point of view of horse color genetics champagne has only recently been recognised as being distinct. The champagne color dilution gene exists in two forms: CHC, the Champagne dilution allele is dominant over the wildtype allele CH+. 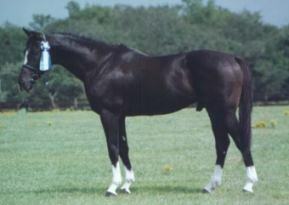 Therefore champagne horses can be either of genotype CHCCHC or CHC CH+. The CHC allele dilutes red to a golden color, and black to a brown or taupe color. 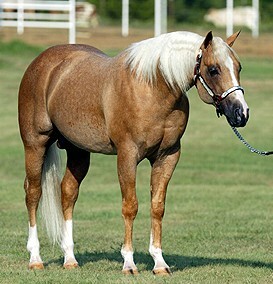 Champagne horses vary in appearance according to the base color and any other color modifiers present, such as flaxen. Although champagne horses have undoubtedly been about for a long time they are only recently receiving recognition as being distinct, having often been mis-classified in the past. Before champagne was recognised in its own right (and sometimes now) champagne horses were often registered as being palomino, buckskin, grulla or even dun (though champagne horses do not have primitive marks like duns). However the champagne gene is completely seperate from the cream and other dilution genes. 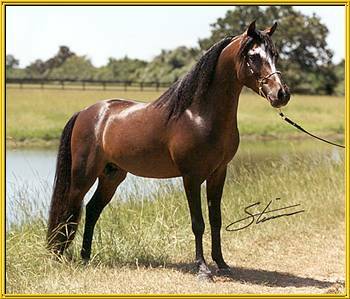 The champagne allele is more common in some breeds and occurs particularly in Tennessee Walking Horses, American Saddlebreds, Missouri Foxtrotters and American Quarter horses and ponies. In addition to coat color the champagne dilution allele affects eye and skin color. Champagne horses are born with blue eyes which gradually turn amber as the horse matures. This color is quite distinct from the brown eyes found in other colors. They also have pink skin, like horses homozygous for the cream dilution gene. 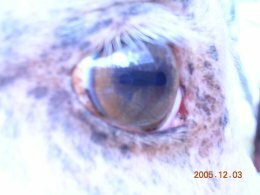 This develops dark freckles, especially around the muzzle and eyes, under the tail, and on the sheath or udder, which are darker and more numerous than for such cream horses. Some champagne horses have reverse (dark) dapples. As with many other colors champagne coats tend darken in the winter. Champagne horses with a chestnut base color are called gold champagne. Gold champagne horses resemble palominos, having a golden color coat. They may have a white mane & tail, or these may be gold colored too. Possibly this depends on whether the flaxen gene is also present, but I don’t think this has been properly tested yet. Gold champagne horses are often referred to as pink or wheaten skinned palominos and usually registered as palomino. Sometimes their coat has a pinkish hue not normally seen in palominos. However the resemblance to palomino is purely in the phenotype (external appearance) as gold champagne horses do not have the cream dilution allele (CCr). One horse – the American Cream Draft Horse seems to have been started in 1911 with a gold champagne mare called 'Old Granny', who is apparently the foundation dam of ninety-eight percent of all the horses now registered by the American Cream Draft Horse Association! Classic champagne occurs due to the effect of the champagne allele on a black base color. The coat is a very attractive lilac tan color, with the points being a darker version of the same color. Classic champagne horses are sometimes mistaken for grulla, and sometimes called "lilac dun". It’s also probable that the suggested existence of a separate chocolate brown color was due to the observation of classic champagne horses, rather than to the existence of allele Bb at the brown locus. 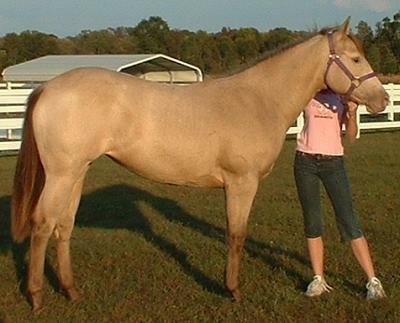 Champagne horses with a bay base color are called amber champagne. Amber champagne horses are usually a golden tan with dark brown manes, tails and points (compared with the classic champagne which usually have points the same color as the body). 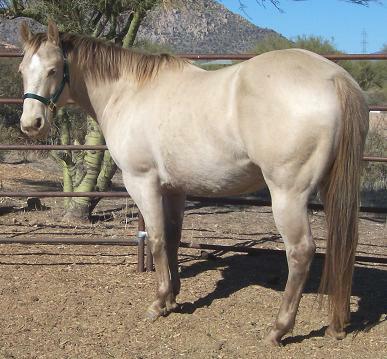 Horses of this color are often registered as buckskin or dun but they actually have brown rather than black points and also have pinkish skin with freckles. 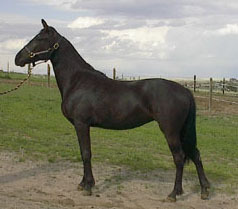 Champagne horses with a brown base color are called sable champagne. The coat color is between amber and classic, but resembling classic more than amber, and often with more shading than either. If it is not clear from the phenotype and pedigree this color could be distinguished from classic champagne by genetic testing at the agouti locus. "Ivory" champagne was the name originally used for the combination of chestnut, champagne and cream (gold champagne with a cream gene, or you could say a palomino with a champagne gene!). Such horses have an ivory-colored body with a white mane & tail, resembling cremellos but with amber eyes. 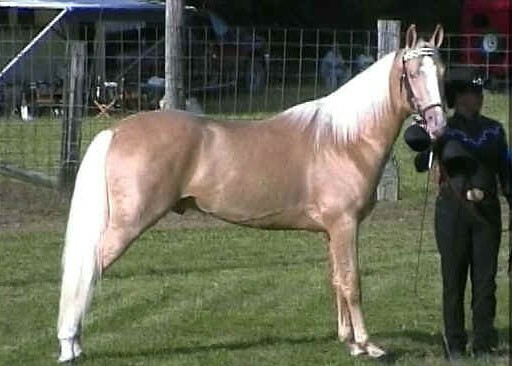 There are, however, also amber and classic champagne horses with a cream genes, with a darker body color and points. Although the term "ivory" is still in usage the International Champagne Horse Registry no longer recognises it as is not the result of the Champagne gene on a base color. Instead the ICHR suggests that in naming Champagne colors one should use the name of the base Champagne color, plus whatever other color or pattern term is appropriate, e.g. amber cream, classic tobiano or sable dun. This makes good sense from a horse color genetics point of view. Each color and pattern has its own page. Click on the links in the table. Most of the color and pattern pages lead to further related pages.